Have you ever considered fostering or adopting a child but weren't sure what to expect, or even where to start? Read through some of the stories from Sanctuary families who have walked this road before you. What made you decide to adopt? We actually had never felt called to an infant domestic or international adoption. We thought we couldn't afford it and felt called to a different area. Our desire had always been to foster children and adopt through foster care should the need arise for one of them placed in our home. However, a few years into our foster care journey God showed us a different vision for our lives and made us reconsider a domestic adoption. We were blessed to foster a few newborns throughout the years we were fostering and had conversations with some of the families adopting those infants. Those sweet babies and their families and the process of domestic adoption stirred our hearts. After a long-term foster child of ours was reunified with his family, combined with our own infertility issues, a clear desire for more children, and a nudge from God, we chose to pause our foster care journey and pursue a private infant adoption. Did you choose domestic or international adoption? How did you choose? This connection of seeing adoption from our end as foster parents....picking up a newborn from the hospital, parenting them for a very short while, meeting adoptive families, hearing birth family stories, and seeing the completion of an adoptive placement was what led us to a domestic adoption. I remember standing in our living room praying over a baby in our home alongside his potential adoptive parents at the time, praying for what ever was going to be best for all involved in the final decision of the birth mom. As we prayed alongside this family and watched them as they stepped out in faith to raise this child, a wave of emotion swept over me. This family encouraged us in that if God has called us to adopt, we would be able to raise the money. And God changed our hearts that weekend. Do you think other families should consider adoption? Yes, it is the most amazing thing to love a child and God calls us to care for orphans. God brings families together in so many different ways and if you have a heart for this we encourage you to seek further. We are continuing our journey with foster care and are excited about loving more children that God brings into our path. We would recommend fostering and adoption to anyone. What made you decide to adopt? Andrew and I both felt God’s call to adoption even before we were married. It was a desire that just never went away and after we were married when we would discuss the idea of starting a family the topic of adoption would inevitably come up. At first we believed it would be down the road when we were more settled and making more money because we didn’t think it was something we could afford so young and working in ministry. However, God kept chipping away at our hearts and our fears in various ways. So, we stepped out in faith and began our international adoption journey in September of 2012. How has adoption impacted your family? Going from a family of two to a family of four, literally overnight, has impacted and changed us in ways we never even imagined. We believed and were told that we would bring home our twins around 18 months of age, but because of multiple roadblocks they came home a few months before their 3rd birthday. Our idea of what life would be like was completely flipped upside down. We were first time parents to toddlers who could walk and talk and who were grieving the loss of everything they knew. Right before we accepted the referral for Elias and Johanna, through a sermon we had heard we felt like God was telling us to open up our hearts to a different picture of the adoption story that we had in our minds. To let go of this “clean slate” and young as possible mentality that can easily come with adoption because of fear. We hadn’t realized what parenting toddlers from trauma would entail and all the ways it would stretch and grow us. It has been very good and very hard, sometimes in the same day. Through it all God has been giving us a deeper understanding of His love for us. Do you think other families should consider adoption? Early on in our journey we probably thought every believer should consider adoption, however, after traveling the long road to adopt and then coming home with our children we know that the call to adopt is unique. If you think that God may be leading you to adopt, then pray about it and He will confirm that desire in your heart in His timing. We don’t believe that everyone is called to adopt, but we do believe that as Christians the word of God clearly speaks to us about being involved in orphan care in some way. There are over 147 million orphans in the world; that number is huge. The opportunities to get involved in orphan care are many. What made you decide to adopt? It really wasn’t our “decision” to adopt. We feel God presented us with a “gift”, and it was up to us to receive that gift. We were not even remotely considering adopting. So how did we end up here, ready to adopt a 7 year old girl from China? Really, it was all God’s doing. Back in February of 2017, I was scanning my Facebook newsfeed. I happened to see a post sharing a local family's adoption story. They were adopting a little girl, Ru from China, but when they found out she had a foster sister, they couldn't bear to break these two girls apart. They were praying and asking if those of us reading the post might consider adopting her foster sister, Ru Qin (Quinn). Then the two girls would remain connected, as well as have families. I was drawn back to this post over and over, looking at the pictures, reading the story, thinking about how we lived in the same city as this family. These girls needed to be close to each other! Quinn needed a family! The next day, thoughts of Quinn and Ru would not leave my mind. I kept thinking about how if we adopted her, not only would she have a family, she would be able to grow up with her best friend nearby. I thought about it seriously enough to bring it up to Scott and our children. What did they think? Was this the Holy Spirit prompting us? What would they think about adoption at this point? At first, I got somewhat surprised looks…because, you realize, Scott and I hadn’t talked about adoption since our kids were little. We weren't thinking about adoption AT ALL. We decided to contact the family who is adopting Ru, and they filled us in on the situation. They explained that part of the "rush" was that the agency was set to lose Quinn's file in a couple of weeks, and Ru's new family was afraid they might lose track of her. Then, Quinn and Ru might never find each other again after Ru's adoption! Long story short, after a couple of days, we knew the decision. We were going to adopt! We knew, deep in our spirits, that God was calling us to make Quinn part of our family. Have you experienced any difficulties throughout your adoption process? Our main challenges have involved paperwork, paperwork, paperwork! There is a mountain of paperwork to wade through and to collect for an international adoption. Not only do you gather tons of personal items, like original birth and marriage certificates, FBI background checks, medical reports, etc, you also have to have to gather copies of these documents and more for your “dossier” to China. You wade through US immigration approvals and Chinese government approvals. In this process, if you don’t have it all “just right”, documents are returned for correction, and valuable time is lost. We have had one such correction that cost us a little over a week, plus we had some delays in the homestudy completion that delayed the process by about a month. What made you decide to adopt? We both had the desire to adopt from a young age, although we didn't talk to each other about it until well into our marriage. After having the boys we decided it was time to pursue this path. Megan's sister also adopted from Russia a few years before we adopted and we watched their process and it confirmed our desire. We always wanted 3 kids and when it came to having #3 we knew there were so many children in the world without parents and we felt the Lord was telling us to add to our family this way. Little did we know He also had plans for us for #4! How has adoption impacted your family?It is so hard to say what our family would be like without Emelia. We may have never gone to Africa, never enjoyed Ethiopian food, never become acquainted and friends with local Ethiopians and Somalians. We may have never heard the call to join a multi-cultural church plant, never chosen to be lead by an African-American pastor. We have learned a deeper understanding of what it means that God has adopted us into his family, of God's love that crosses any divide. Adopting Emelia has been a true joy to our family and the journey is still young! Do you think other families should consider adoption? Of course! There are all sorts of reasons not to adopt, but they lose their power to faith in a God who provides what we need as we do the things that are near to his heart. God has a heart for the orphan. The fact that there are children, made in the image of God to be in a loving and nurturing relationship with parents and family, are without a family is the greatest reason for considering adoption. What made you decide to adopt? 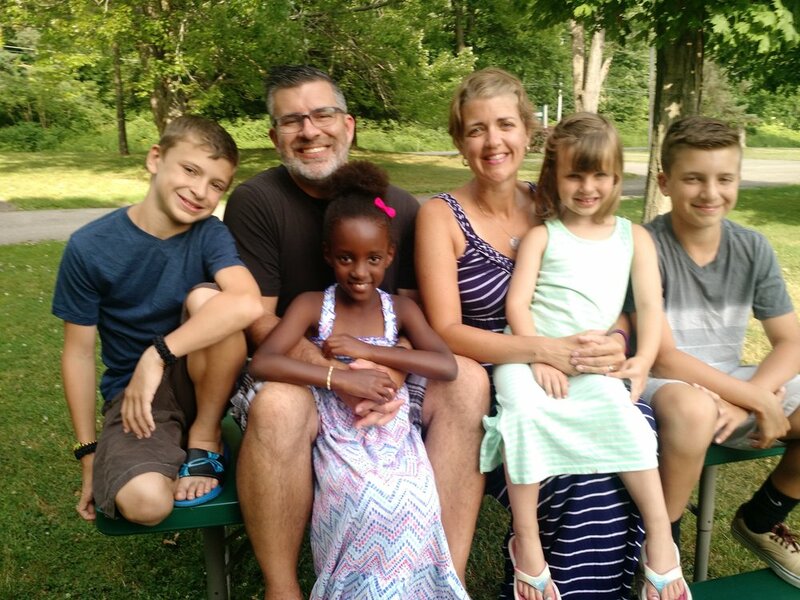 We decided to adopt because we want to begin growing our family and we want to do it in a way that reflects God’s heart for orphans and all nations. We are sons and daughters because God took us in. Are you in the process of adopting internationally or domestically? How did you choose? 140 million children are considered orphans worldwide and an estimated 30 million of those children are from India, making it the country with the highest orphan population. We love our relationships with Indians and feel even more connected through our traveling in India. This mixed with how we desire to prioritize diversity, led us to our choice. Have you experienced any difficulties throughout your adoption process? We are 1/3 of the way through the adoption process and haven’t experience much difficulty. What made you decide to adopt? We hadn't considered adoption seriously before hearing the stories of other sanctuary families who had been through the adoption process. Ultimately, our infertility pushed us towards adoption, but at the same time we felt very called to the entire process and eager to begin our family in this way. It doesn't take long after researching adoption and seeing children in need to feel that call in your heart. We've chosen to adopt a child who is a newborn up to 3 years old for this first adoption, but our hope is that after our journey here we can continue through foster care or the adoption of an older child/children. Are you in the process of adopting internationally or domestically? How did you choose? We decided to adopt domestically after exploring all options and avenues. We love the idea that our future child or children can still see and hear from their birth mom with an open domestic adoption, whereas most international adoptions are closed. Additionally, the cost of international adoption deterred us as well as the travel requirements many countries have. Have you experienced any difficulties throughout your adoption process? We were so thrilled when we very quickly raised the money we needed to sign on with our agency and be presented to birth mothers. As professional writers/designers, we also felt very comfortable designing our profile and felt very confident in God's plan for our adoption. Now that it's been roughly a year and we still haven't been chosen, we've faced difficulty and pain that rivals the pain we felt with infertility. We cling to the hope that we will eventually be parents and that God will allow us to be His vessels to a birthmother and her child in their time of need. You can view Kristen and Jon's adoption profile here: http://bit.ly/2vY88p7. What made you decide to adopt? A big part of our adoption decision was just the desire to be parents. We had not conceived naturally up to that point, and we were ready to have children. But a sense of justice was also important. It just didn't feel right that there were children anywhere in the world who did not have family to keep them safe, know them, love them, and have their backs no matter what. How has adoption impacted your family? Our family wouldn't be our family without it. Each child who joined our family added qualities, quirks, talents and perspectives that our family would not have otherwise. Did you do international or domestic adoption? How did you choose? International. We were living in China at the time we decided to adopt the first time, so it just made sense to adopt from there. And then we had a connection to China, so we adopted our second child from there as well. We have also fostered, and could see ourselves adopting domestically through foster care, but so far that hasn't happened. What were some of the joys you experienced with fostering? We got to know our kids! We were there when one lost her first tooth, and we taught her how to ride a bike without training wheels. We watched another one go from barely speaking to combining words. We sledded down the hill in our backyard together, cooked together, read books together, and went camping together. We have so many precious memories that will always be part of the fabric of our family, and they will be part of our foster kids' story as well. Do you have any advice for others considering foster care? It's okay to say no to a placement. There is a lot of need out there, but it does neither you nor a potential child any good for you to take on an unhealthy level of stress out of a sense of guilt. Know what your limits are, whether it's the number of children you can manage or the severity of behavior issues or whatever, and know that you are making a good parenting decision by staying within your limits. Your limits will grow with experience. And take advantage of whatever support you need to stay emotionally and relationally healthy, whether it's respite care or putting the kids in a winter break camp so you can do that project you never have time for that is driving you crazy. Also--and this may sound contradictory, but I have found it to be as true as what I just said--the situation that feels overwhelming at first will become your new normal, and you will find ways of coping more gracefully than you imagined. So be judicious about what situations you sign up for, but once you're in the middle of it, use any help you can get to get you over the rough patches, and you will find your feet.